Black and White Is On Trend! Looking for some inspiration for your bathroom decor? Why not go the simple route with the classic and always fashionable black and white? In all parts of the home, black and white is going strong, and will go on strong for quite a while. It's easy, simple, and flexible. Black and white lets you use your favorite accent color for just a dash of happy. You can also quickly change that accent color with small touches like accessories, linens, a new mirror, or a new coat of paint on the door frame. Let's have a look at some beautiful black and white bathrooms. If pure black scares you a little, then you might want to look into really dark grey, as in this classic bathroom with modern edges. It still has the elegance of black and white, but with a little more softness. Dark grey is just as easily matched with an accent color of your choice. In this case, the touch of green through the plant growing near the bathtub is all this bathroom needs to be welcoming and cheery, rather than cold and stark. A black and white bathroom doesn't need to be modern to work. Take this eclectic, neo-Victorian home for example. The bathroom has interesting retro elements: the curtain above a freestanding tub, the well-worn leather armchair, the impressionist portrait hanging just in view of someone taking a bath or a shower, and the industrial faucet with exposed pipe. And with just a dash of red via the cushion and the reflection in the mirror, this bathroom really stands out. Black and white can be just as quirky and personal as a more colorfully eclectic decor. All you need is a basic idea, a few interesting items, and an eye for good placement. With plenty of white to spare, this black and white bathroom is a light, minimalist design with an especially great flooring choice. To avoid making this room seem small and claustrophobic, the design here is focused on white (and a lot of it!) with black to accentuate mirrors, windows, and doors. The touch of color via the flower vase on the countertop is just the perfect amount, and enhances rather than distracts from the overall design. And, of course, the flooring is possibly the best thing about this space. This wonderfully ornamented mosaic tile adds movement and visual interest, and stands in contrast to the more geometrical, minimalist style of the rest of the room. This Norwegian designer knows how to use black and white. Take this really interesting bathroom for example: the shiny black floor is continued on the walls, which then suddenly become white. The white tub stands in stark contrast to its black background. The accessories are minimal, and all black and white as well. This is a carefully composed and perfectly executed black and white design that simply must be experienced, rather than explained. A touch of gold to this black and white patterned bathroom makes all the difference. This bathroom perfectly balances the strong black geometrical pattern on the walls with golden softness on the mirror and the hardware. Notice the cute flowers in a very simple white pot, which almost disappears in the background. And the French-style doors are simply the best here. It adds a really nice and open dimension to this otherwise small, but well-designed, space. This master bathroom shows that black and white can be used for larger spaces, too. Not afraid to use plenty of black, this bathroom brings together the best of both shades. The floor is elegant and has just enough pattern to be visually interesting; the walls and other vertical spaces are dominated by white, and framed with just enough black to bring a good visual structure. I especially like how the shower is almost lost in the room, as if it wasn't really there. This gives the design itself all the space it needs to shine and impress. If you like the look of the marble countertop in this bathroom, check out how to get the look of marble for less. Let's not discount the more feminine approach to black and white, as exemplified by this cute, eclectic yet elegant bathroom. While heavy on the white, the subway tile, the black chandelier and the black metal basket really bring out an interesting, almost etched, softness to the whole. The result is elegant, personal, and definitely feminine. The rounded softness of the pedestal sink is an especially good contrast to the straight geometric definition of the flooring. An all-black floor. An all-white wall. This should be stark and boring, but it isn't. Why? The patterns on each. The tight and quickly moving herringbone pattern on the wall stands in contrast to the calmer, almost sluggish-looking hexagon on the floor. The black pentagon flower-pot on the white, wall-mounted narrow sink is a stroke of pure genius. And in this small space, the side faucet is a smart choice. This bathroom is design-savvy, clever, beautiful, and definitely something to tell the neighbors about. Here's another interpretation of the traditional bathroom in black and white. This fun, cheery design takes full advantage of the natural light from the large window to avoid a dark, closet look. But what really makes it interesting is its combination of patterns in the tile. Three different patterns, two on the walls and one on the floor, make this bathroom the opposite of boring. Some might say it's a little bit overwhelming, especially if your tastes are more minimal. But if this is your kind of thing, this bathroom definitely has movement and personality. 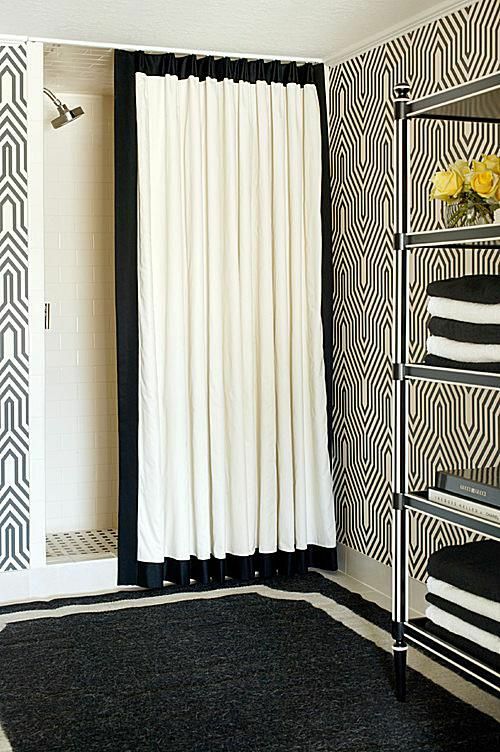 The black and white striping on this bathroom by Q Construction, via Houzz, has almost a circus-like feel. The floor stripes bring your attention towards the shower space, which continues the stripes up the walls. Everything has been carefully chosen to fit the theme, along with the bright touches of red that really make a difference here. Instead of a boring bathroom you get something original and quite visually striking. This cute little attic bathroom shows that there's plenty of space for you to add your own creative touch to your decor. The hex tile is used to add flower patterns on the floor and walls using contrasting black and white pieces. Since the tiles fit together no matter the color, you can add these flowers basically anywhere you're using the tile. Instead of a boring black floor/white wall hex pattern, you get something a lot more fun. Black and white doesn't just suit more contemporary styles. It also works really well with more retro and/or industrial styles, as this bathroom shows. The double farmhouse sink is perfect for a master bathroom, and the use of a single shelf above it saves a lot of space and opens up the room. A few touches of green make the whole look welcoming and organic. With something as simple as black and white, you can go bold with a show-stopping wallpaper like this geometric pattern. Because it is very busy and full of movement, you want to keep the rest fairly low key. A simple carpet with only a white frame, and a white shower curtain with a black frame highlight the wallpaper and keep in harmony with the theme. Black and white is striking enough on its own, if you know how to use them well. This wonderfully minimal bathroom shows that with that simple contrast, you can successfully design a modern, minimalist bathroom that's both functional and beautiful. This is another, more daring example of the possibilities of black and white hex tile. This tiny bathroom works as a wet room, with the toilet right in the showering space. But with that fantastic tile, the whole makes you want to say "wow! this is great!" rather than "ugh, this bathroom is so tiny." Although the main theme of this bathroom is black and white, there's a fair amount of silver, which brings out the veining in the marble and the light from the window. Even the silver feet on the freestanding tub work to bring attention to the beautiful contrast of the tub itself. This simple white bathroom with subway tile is enhanced by an open black vanity and a cool fossil wallpaper, perfect for science-minded kids. A double vanity with gooseneck faucets ensures that everyone can wash their hands and brush their teeth together. This fairly typical-sized bathroom is made bolder with a split herringbone tile pattern: one half black, one half white. This unusual design really gives this space a bold, graphic look that's modern and trendy. What an amazing way to open up the space in a bathroom! Instead of setting your alcove tub against a wall that cuts the space in half, get rid of the wall and install a rail curtain all around instead. This bathroom shows what a little thinking outside the box can do. Bright and clutterless, this minimal bathroom features recessed shelves (to save space) and a strong black-white contrast. The floor looks larger, thanks to black baseboards, and a soft, textured mat helps bring the whole together. Making subway tile walls more interesting is easy if you build your own toothed wall edge. It doesn't have to be black and white, either, but the contrast in this bathroom is quite striking and bold. The graphic finish highlights the luxury of the bathroom, as it comes with monogrammed hand towels and a beautiful vignette. The decor elements are in keeping with the black, white and gold theme throughout. If you plan on combining several different textures and patterns in the same space, it's best to keep the color scheme simple. This bathroom shows that it can be successful. There is enough space to accommodate the different tiles and textures, but everything is tied together thanks to the black and white theme. Yes, sometimes you can mix and match to your heart's content. Can you see the floral pattern in the black wallpaper? The decadent, almost gothic feel of this wallpaper is lightened by the large, shiny wall paneling and minimal washstand. This bathroom features a very simple yet effective contrast that really makes you stop and stare. This cool, eclectic bathroom features a large black hex tile floor and bright, luminous white walls. The black window frame continues the theme, while the tub and mirror add a gold accent that's a popular choice for black and white spaces. A small glass buffet holds towels and bathroom staples.